Overall, a fun course. Loved running while it was snowing out. The organization was lacking compared to the Brooksie Way(or at least I had very high expectations since the Brooksie Way has always done an excellent job) but it was still a good race overall and a good option for January. Happy to have something close to home for a change. 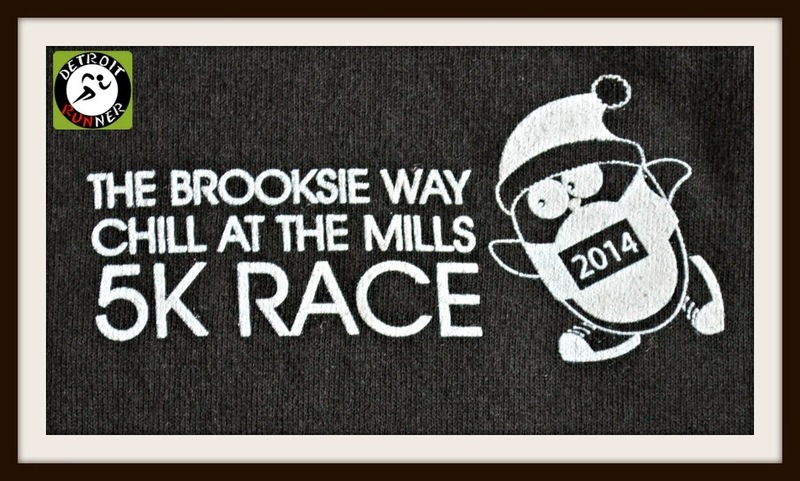 Registration was very simple and completed on the Brooksie Way website. I think it would have been nice for the Chill at the Mills to have their own website with all the details of the race. 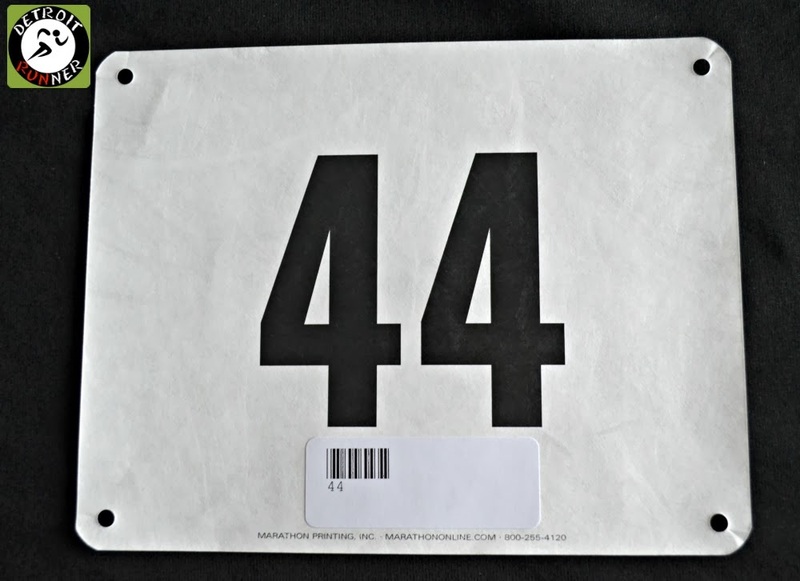 The race had minimal information on the website compared to what they do for their half marathon. Having a separate website with information just for the 5k would have been more helpful. Also, they should have a Facebook page just for this race to make things easier. I believe the official name of the race is Chill at the Mills with an S at the end but material on their website showed no S so hopefully they will correct that but I believe the S should be there as the shirt and gloves I received both had S.
It was a snowy morning as I headed over to the start area as you can see by this picture I took of downtown Rochester. It was nice to be able to get up a little later since I'm only about 20 minutes from Rochester. 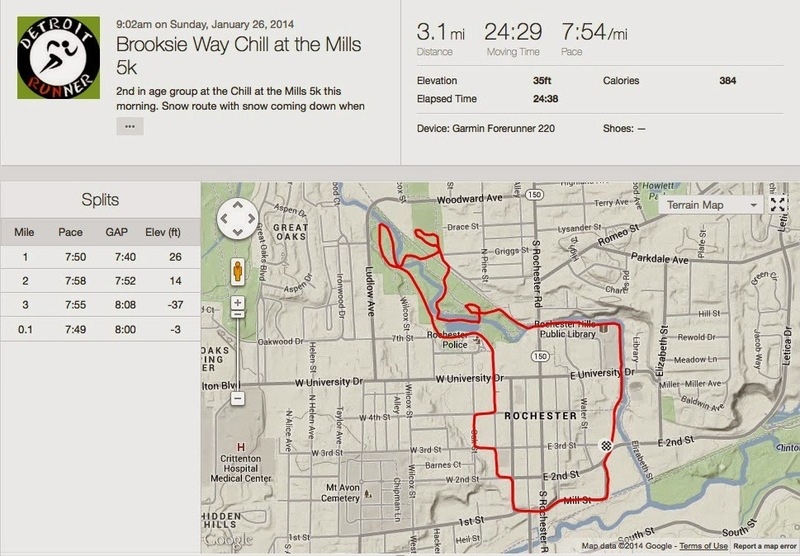 The Brooksie Way Chill at the Mills is done in conjunction with the Fire and Ice Festival in Downtown Rochester. They had all kinds of activities all weekend including this race which is in it's inaugural year. Because it was put on by The Brooksie Way people, I had very high expectations for the race. The start area was also the same area for all the activities for the weekend festival so everything was quite organized. They had a tent set up for vendors and so runners could stay warm before and after the race. Without this, it would have been crazy cold there. The organizers also had some specific ice sculptures related to the 5k - an outstanding idea and they were really cool too. They also had several fire pits around that helped keep you warm which was also another excellent idea. This one was literally 50 feet from the start line. As you can see, the race timing company was getting everything ready when I got there. In addition, they had an ice sculpture of the Brooksie Way logo which was really cool. For those of you that have not run their half marathon, I strongly recommend it. A great challenging race. As you can see below, the warming tent had picnic tables as well as standing tables for people to mingle before the race started and also after to get your free beer from Rochester Mills Beer Co.
Race day packet pickup and registration was also inside this tent. Thanks goes out to all the volunteers for helping out on this extremely cold day. The volunteers in the tent had it easy compared to the marshals on the course since it was crazy cold if you just had to stand there. The Rochester Mills Beer Co. had a couple awesome ice bars set up with their canned beer in the middle of the bar. Great idea! The race also had several port-o-potties for use. I didn't use them but there was a small line for them prior to the race. It seemed to be enough for the crowd this year. Before the race, I also met up with several members of the Southeast Michigan Runners Group so we could get a pre-race picture. As we got into line for the start of the race, it was very easy and not overcrowded so we didn't need to line up until five minutes before the start. They sung the National Anthem and we were ready to race. The course was exactly 3.10 miles according to my Garmin. Overall, it was a fairly flat course with one small hill near the beginning of the race and a couple minor hills after but otherwise fairly flat as you can see by the elevation below. The layout of the course had you go around in the neighborhood downtown and into the park and back by the library. No PR for me but I did end up placing second in my age group which was cool. Disappointing that there were no age group awards(or if there were, it was not communicated well) - figures when I placed in the top three. I was pretty happy with my results given the slick course. The course was fairly slippery but the race did what they could to keep it clear with some salt in areas. It was also plowed throughout the course but with the morning snow was not completely clear. The race did the best they could given the weather. The announcer said, ready, set, go and we were off to a fast start. There was a quick turn and you get an idea of what the surface was going to be like given the morning snow. It snowed the entire race which was actually really fun. We headed down Mill street towards Rochester road with Mill being an industrial area of Rochester. It's also very close to the Clinton River trail system. At the end of Mill street, we ran under Rochester/Main street and a slight hill was there to start us off. Mill turns into First street and we took a turn onto Walnut which is the largest hill of the course but still no big deal. As you can see, it's a hill but it's not really that bad and the race had this section nice and clear for the runners so we didn't lose traction on this part. As we headed into the neighborhood, you got a picture of all the different homes near downtown Rochester. It feels very similar to the Plymouth area for those that have run a Kona race before. I would really love to see the course turn onto Main street and run down the middle of Main but understand that this is a State road and to get this closed is probably near impossible so we continued through the subdivision. We made our way towards Rochester Municipal Park or "the duck pond" as many of us locals call it. The park is a fantastic place for a run not only in the winter but really all year long. This is where the start of the Paint Creek trail is, yet we did not run on the Paint Creek since it's not cleared in the wintertime. Before we knew it, we were already at mile one of the course. As we continued, we entered the park. While I've run in this park countless times, I've not run it much in the Winter. It was an incredible part of the course and was really pretty inside it. The river was flowing right next to our run and was snow covered and frozen. Couple that with the falling snow made for a really nice path for runners. As we got to a loop, it was not clear which way to go on this first loop. While the picture below shows it's very clear with the orange cones and people coming, the people near the front of the pack, didn't have other runners already around so it was a bit confusing but I asked the volunteer which way and she pointed us in the right direction. I barely caught mile 2 in my camera as we continued running in the park. As we ran in the park, there was a small down hill that you needed to watch your footing for but it was still really fun to run this part of the course. We then ran over one of the bridges in the park. I love running bridges and these are really fun ones to run over. We continued along to the second bridge and the two guys ahead of me stopped(long enough that I caught up to them) because they were unclear which way to go so we all yelled to a volunteer to ask. There really should have been a volunteer at this location to direct people. While there were orange cones blocking most of the ways for us to keep us moving, this area was sort of open so I can understand why they were confused about which direction to go. The volunteer directed us and we were back on our pace again. As we made our way out of the park, we ran under Main street again, in a different area, and again along the river near downtown. This was also a really nice part of the run and I love running this area in the summertime especially. Continuing straight along this path takes us behind the Rochester library. I remember when the library was built years ago and it's an amazing resource for those in Rochester. After we past the library, we kept going on the trail. The runner in front of me almost turned off the course where the police were directing traffic but they told him to keep going straight so I followed. We we came around the bend and ended up back in the parking lot with one more turn into the finish line. There there no aid stations for this race. I still feel there should be one for a 5k but I'm beginning to think most race directors don't feel it's needed given the cold. Not that I need one but I'm sure there are others that wished for a half way aid station. I will say the last four 5k's I've run did not have any aid stations either. The finish area was in the same spot as the start line. The race had some pretzels, chips, cookies and water lined up at a table for the runners. Because it was a smaller race, there was no back up but I think that it would have been better for this food to be inside the warming tent instead of outside. The best part of the finish? A free beer from Rochester Mills Beer Co. You also had the choice of water or coffee if you didn't want a beer at 9:30am in the morning. I figured, what the heck, it's a free beer, I'm not going to pass that up so I chose a Milkshake Stout to finish off my race. Every race needs to finish with a free beer! Haha! The race was $25 when I signed up for it plus an online fee for a total cost of $27.69. For your registration, you received a chip timed course that was partially free of traffic. A free finisher beer from Rochster Mills Beer Co. and some finish line food including chips, pretzels, cookies and granola bars. 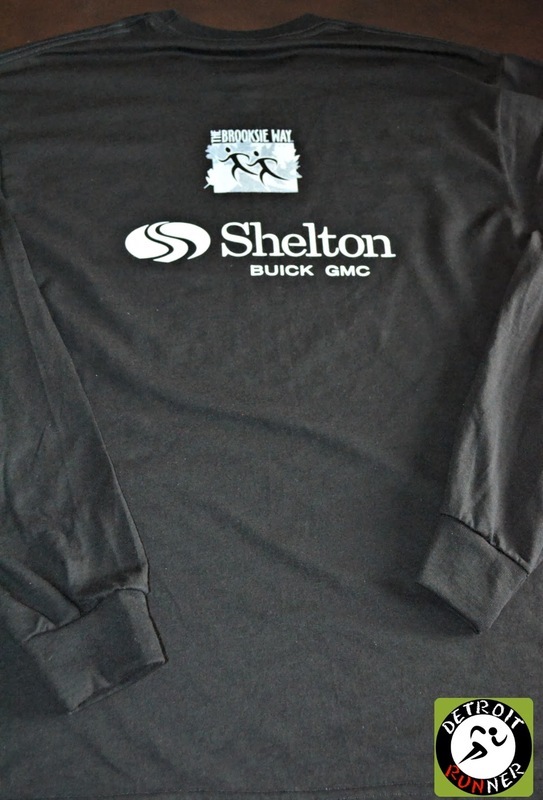 You received a long sleeve cotton shirt, if you pre-registered(although I heard they ran out), and you also received a finishers choice of cotton gloves or a headband. The gloves and headband were a nice touch. 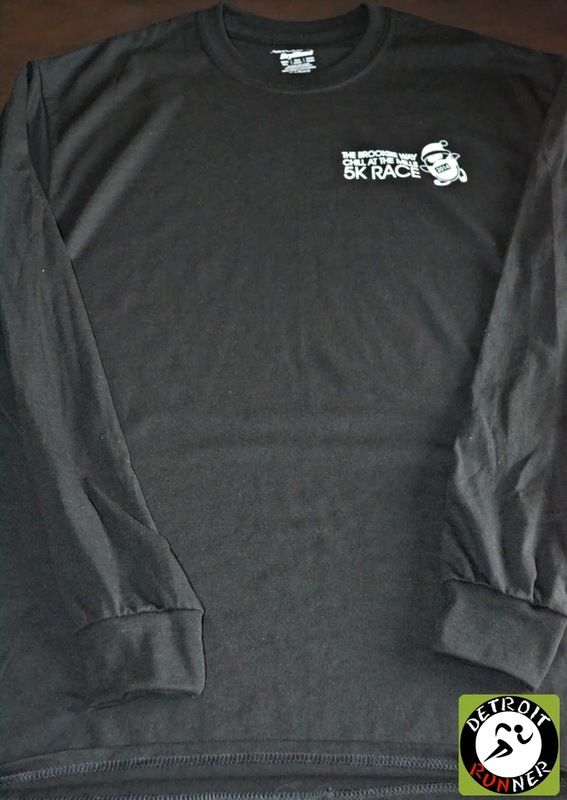 I never wear any race shirts that are cotton long sleeve shirts so I gave it to my daughter for a sleep shirt. I wish they would do a tech shirt like they do for the Brooksie Way and I think more people would wear it to advertise the race more. All my Brooksie Way shirts get used regularly. Personally, I think they could have really done a nice finishers medal with the penguin logo or even the fire and ice logo instead of the gloves or headband but it was a good value for what you received. They also had an opportunity to make a great bib instead of a plain white one shown below. While this was an inaugural race, I had very high expectations given the Brooksie Way organization was running the race. The organization was lacking in a couple areas in my opinion. First was the communication. They needed to have a website separate from the Brooksie Way website so it didn't feel like it was an afterthought to add it to their website. A Facebook page would have also been easy to set up. This could have provided all the FAQ's for the race itself. The name of the race I assume is Chill at the Mills with an S but still not sure. As my running buddy said, just to be safe, we will call it Chill at the Mill(s) to cover both names. The course, while an excellent layout overall, was a little confusing at the circles in the park. A couple more volunteers in spots could have helped at least the front runners with directions. Runners should not have to wonder where they are going during the race. I will say that it was extremely cold race day and perhaps they were short volunteers where needed. Overall, it was still a great race. I will give them the benefit of the doubt that they needed to learn a few things given this was still an inaugural race. I loved the ice sculptures and the course overall was a very nice track especially in the park. I personally think the fact it was snowing that day added to the fun. Free beer at the end is always a plus even though I don't make it a habit of drinking at 9:30am - ha! I'd do this race again and hope they can make improvements to it next year so it's even a better race. Nice review. A quick question.. Were the paths slick at times?? I have never ran on a snowy path. Wondered if you need different shoes for the snow?? Yes it was slick. Trails shoes, which I wore, certainly helped but you could use regular shoes without issues. I like medals, but don't like the trend towards medals for 5ks. Not saying it isn't an accomplishment for some, but it drives up the cost and complexity of the event a bit. I like the gloves or hat idea. I understand on the medal Josh. I also agree on the AG award - really nothing for all my efforts? Free beer, hot chocolate would have been a better idea!!! Coach - they had that too but we don't get beer at the end of races too much so I could not pass it up!